NVIDIA Home > Support Home Page > Knowledgebase Home Page > How do I test the 3D Vision Stereoscopic 3D mode? The Test Stereoscopic 3D button and drop-down list on the Set Up Stereoscopic 3D screen in the NVIDIA Control Panel provides the ability to test stereoscopic 3D viewing and the ability to run the Setup Wizard and the Medical Image Test. Clicking on the Test Stereoscopic 3D button displays a test application that allows you to adjust stereoscopic 3D effects so that watching GeForce 3D Vision is comfortable to you. When you have finished any adjustments, press the Esc key to exit the stereoscopic 3D test screen. When using a 3D TV I run the “Test stereoscopic 3D” application from the NVIDIA Control Panel, the NVDIA logo appears in 3D, but I still cannot play games in 3D. How do I fix this? I noticed Microsoft now has a stereoscopic 3D option on their display properties control panel. How do I enable 3D Vision on Windows 8 RTM? 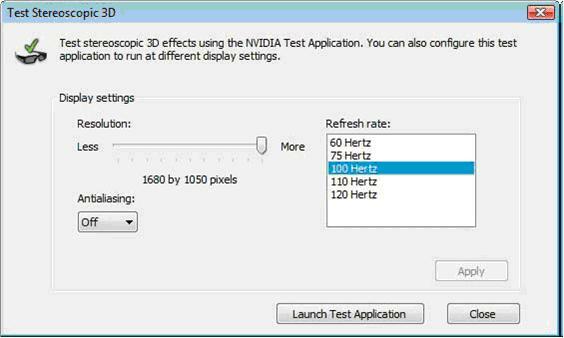 With NVIDIA creating 3D Vision Pro, are you going to disable support for other stereoscopic 3D displays?